Great event, great whiskies, great people. Whatelse?! I love Grant’s 18 years old. Another great twasting with Steve from The Whisky Wire. This time we have had the pleasure of tasting Grant’s 12 years old, 18 years old, 25 years old and Ale Cask Finished with Ludo Ducrocq, global ambassador for Grant’s whisky. We followed the usual order from youngest to oldest: Ale Cask, 12, 18 and 25 years old. Grant�s Ale Cask is the only Scotch whisky to be finished in barrels that have previously held ale. Finishing is the additional time our whiskies spend in specially selected oak casks after they�ve been matured, which adds further flavour and complexity. Nose (85): average. honey, citrus zest, malt, raisins. Really cool influence from the cask. The malty character of the beer is really there shouting about. Palate (90): light, powerful. honey, citrus, frizzante, apples, cocoa. Delicious taste. Frizzante almost like soda. Finish (85): average. citrus, honey, malt. So based on other whiskies I have already tasted I rate this Grant's Cask Editions Ale Cask Finish with 87 points over 100. The rest of whiskies we tried on the tasting were only available at travel retail, which it is a pain because it means I will have to fly just for buying a bottle of Grant’s 18 years old. 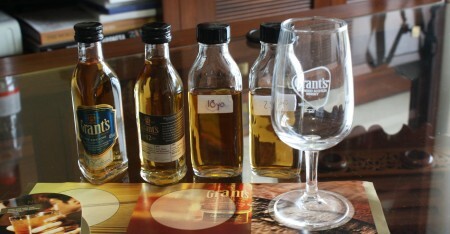 Grant�s 12 Year Old introduces you to another dimension in Scotch whisky. A masterful blend of only the finest single malt and grain whiskies, each matured in oak casks for a minimum of 12 years. The blend is then finished in first-fill American whiskey casks for a further six months. This imparts an extra flavour layer, resulting in a complex whisky where individual tastes fit together perfectly to create a full-bodied Scotch of exceptional richness. Nose (80): more than average. honey, vanilla, citrus, cinnamon, wood, smoke. Palate (86): light, smooth. honey, wood, peat, pepper, vanilla, a little peaches. Finish (83): average. wood, spices, honey, a little vanilla. So based on other whiskies I have already tasted I rate this Grant's 12 year with 83 points over 100. The finest single malt and grain whiskies, matured to perfection for 18 years or longer in oak casks, are then selected by our Master Blender for finishing in port casks. This creates a magnificent, perfectly balanced Scotch whisky with considerable depth of taste. Nose (90): more than average. honey, vanilla, a little citrus, floral, red fruits, wood, peat. Palate (91): light, smooth. honey, wood, red fruits, floral, cocoa. So based on other whiskies I have already tasted I rate this Grant's 18 year with 90 points over 100. Nose (88): more than average. honey, wood, spices, nuts, floral, dried fruits, figs. Palate (92): light, powerful, oily. honey, candies, spices, wood, dates, cocoa. I love the way honey and candies work on this whisky. Finish (90): longer than average. wood, spices, honey. So based on other whiskies I have already tasted I rate this Grant's 25 year with 90 points over 100. Lovely whiskies. I really don’t understand why most of them are so hard to find. Lovely 18 and 25 years old. And I am really in love with Ale Cask, it has a point of almost frizzante. Delightful!